Scaremongering about health and safety is a counterproductive process. It carries the potential to frighten, alienate and panic facility managers, causing poor decision making, or even a denial of the issue. Health and safety decisions should always be calm, considered and built on evidence. Yet even a cursory glance at official HSE figures for costs associated with work-related accidents could be enough to send the most pragmatic of health and safety procurers running to their local PPE supplier. In the UK alone, the cost associated with workplace accidents is £4.9bn per year ( HSE – Costs to Britain of workplace fatalities and self-reported injuries and ill health, 2013/14 ). Annually, there are over 475,000 occurrences of employees taking up to six days off work as a result of a workplace accident – and a further 154,000 occurrences of workers taking even longer – and that’s before we even consider the 140 or so fatalities. The average cost of an accident ranges from £1.6m per fatality, to £7,500 per non-fatal injury. Clearly, these are figures that can damage, even devastate a business, whatever its size. But they perform the function of highlighting the very real need for health and safety best practice that greatly reduces the likelihood of accidents occurring in the workplace. This isn’t scaremongering – it is the hard facts of health and safety at work – and every facility manager, managing director, or procurement advisor should be aware of them. Let’s examine a typical non-fatal accident and the effects it will have on a business. A lightweight counterbalance forklift truck, traveling at 12kmph with a total load weight of 3,570kg impacts a piece of equipment at a 90-degree angle. This will transfer around 20,000 Joules of energy to the object – enough to damage the forklift, the piece of equipment and potentially injure the driver (if the impact was on rack legging it could be catastrophic). An employee who was working on the piece of equipment is lucky not to be seriously injured, but has suffered some injuries from the equipment becoming displaced and is psychologically traumatised. The repercussions on a business begin immediately as the costs start to accumulate with the facility manager’s worst nightmare: downtime.A large-scale incident of this nature will likely halt productivity across a whole facility. In major automotive plants, it is estimated that downtime costs an average of £15,000 per minute (£900,000 per hour), on a typical SME food packaging line, it costs around £24 per minute. Over time, some production may be able to restart, but it may be weeks or months until maximum capacity is regained. Some orders may need to be cancelled. Perhaps overtime wages will need to be considered to cover lost production and procedures will need to be examined in time consuming detail – perhaps with the Health and Safety Executive in tow. The obvious costs of maintenance, repairs or replacements for the vehicle and the equipment involved can vary wildly – but are likely to be significant. Depending on the severity of injuries to staff there may be a range of costs attached, including first aid treatment, off-work salary, new staff recruitment, training and salary costs, possible compensation pay-outs or lawsuits and the avalanche of legal and administrative documentation that needs addressing. A report by Oxford Economics ( The Cost of Brain Drain – Understanding the financial impact of staff turnover, February 2014 ) estimates average costs of over £30k to replace a member of staff, made up mostly from the cost of lost output while a new employee ‘learns the ropes’ (it takes new staff around half a year to reach maximum productivity) and the logistical costs of recruiting and absorbing a new worker. Other estimates of staff turnover costs place a percentage of their annual salaries as the real costs of re-hiring, with mid-level employees earning over £30k per year costing about 150% of their annual earnings to replace. In a world where business owners are responsible for the welfare and safety of their staff, the knock-on costs of an accident can be astronomical – and that is before the often even more costly secondary factors are considered. After the earthquake comes the tidal wave. There is a related line-up of other less tangible expenses that have the potential to endure even longer. Take the company’s reputation and credibility. No business wants to get involved in massaging the PR fallout (more costs!) of a workplace accident. No business wants to deal with the messy business of a damaged reputation. But more importantly, no potential client would want to do business with a company if they thought that company was lax or lacking in its operating procedures. After all, a company with a reduced capacity to operate, or a company being dragged through court, or a company with failures in its health and safety practice is a company with potential to underachieve for its clients. In business, ‘mud sticks’ is a truism. Rumours of a bad reputation can spread extremely quickly in the business community. Existing customers may be placated, particularly if they have had previous good service, but new customers may become much more difficult to find – and as all businesses know, new customers are the lifeblood of successful companies. On top of this, insurance premiums are likely to suffer as a result of an accident. Any no claims bonus will be forfeited, but compulsory insurance, such as Employer Liability, will likely rise. Even those employers with solid insurance may discover the accident is not fully covered, depending on its nature. Any uninsured costs will come directly from a company’s ‘bottom-line’ profit and, in some cases, there may even be difficulty in obtaining future insurance cover. Some other effects of a workplace accident are more difficult to quantify, but there is growing evidence of the negative psychological and behavioural consequences that follow the aftermath of a serious incident. Consequences which keep workers absent for longer periods, or contribute to reduced performance at work. The psychological and behavioural consequences can include post-traumatic stress disorder, a higher number of cases of anxiety and depression when compared to a control group, disturbed sleep, frustration and anxiety about the future – even detrimental changes in the behaviour of associated children. Indeed, the connection to further social issues, such as impact on family life, social isolation and economic problems is strong. It is also extremely difficult to completely gauge the residual psychological effects on other members of staff who were witness to, although not directly connected to, the accident. In the cold light of business, these factors contribute to reduced productivity and increased costs over an indefinite period of time. One often overlooked factor of the workplace accident is the effect on employers. While few will have sympathy with a business owner who has deliberately overlooked health and safety best practice, there are still business owners with good intentions who have simply failed, through poor planning or bad advice, to implement suitable safety practices – and while excuses are no excuse, particularly where an injured employee is concerned – the aftermath of an accident on the wellbeing of employers can be extremely negative. Managing directors have the stress of dealing with the immediate accident situation while also trying to maintain the business and their other responsibilities to their employees. They may need to facilitate access for the HSE or other authorities and it is likely there will be very stressful legal implications, from compensation claims to fines to liability and court costs – and a ship with a wounded captain takes a perilous course. Except in far flung corners, most employers today understand the benefits of good health and safety practice, but not every employer understands the real implications of a workplace accident. Hindsight might be a wonderful thing – but for businesses who neglect or ignore health and safety, it can also be filled with regret. And in health and safety terms, the only way to live without regret is to put accident prevention and protection at the heart of a facility. 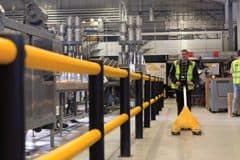 A-SAFE is the manufacturer and inventor of fixed, flexible safety barriers that protect people, property, profits and performance in industrial environments. For more information, please visit www.asafe.com .